Is it an easy set-up? - Yes, just one plug in your storage device and hit play! What file types are supported? - All common ones! Can I connect it to a bigger monitor or computer? - Yes, just use an HDMI cord! Can I display photos and videos in the same slideshow? - Yes! PERFECT FOR RE-LIVING ALL YOUR FAVORITE MEMORIES. 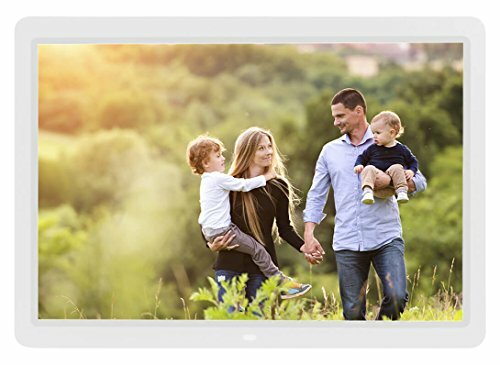 Have your most loved photographs and videos displayed all day! WIDE VIEWS - The 14 inch screen looks great at any angle in your household. It is even wall mountable. ONE-STEP SETUP - Simply plug in your storage device and then choose it from the main menu to get your photo sharing experience started! MORE FEATURES THAN YOU'D EVER NEED - Your frame comes with a motion sensor, 16 GB of internal memory, 2 speakers, a calendar, and a clock, a remote, and more! LIFETIME WARRANTY Plus 30 Day Money Back Guarantee Make this purchase completely hassle free!